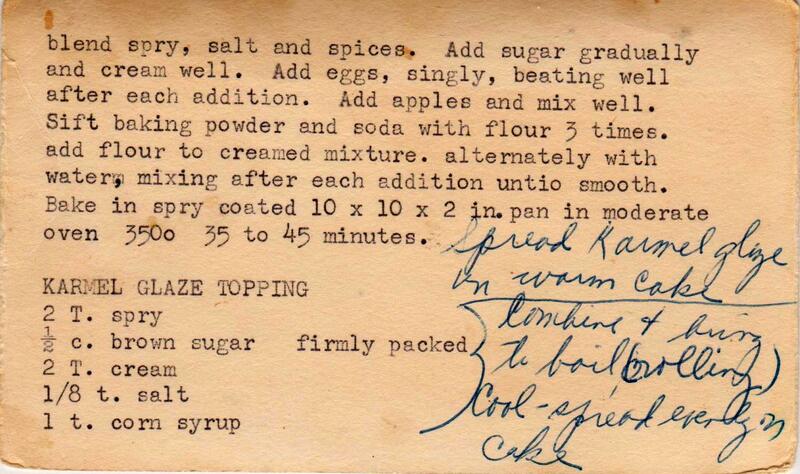 The recipe is from a vintage recipe card box from Lancaster, Pennsylvania, and couldn't be easier to make. 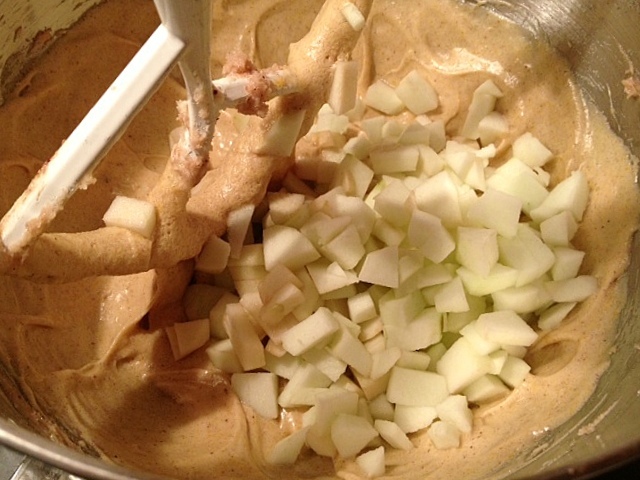 Mix up the batter and add in the diced apples. 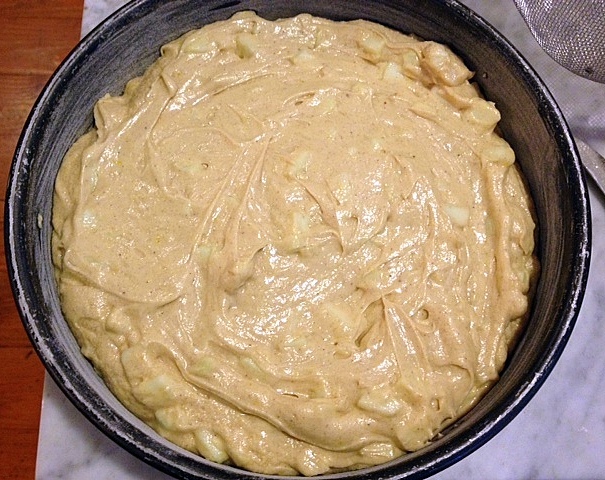 Spoon into a pan, which has been greased and floured. 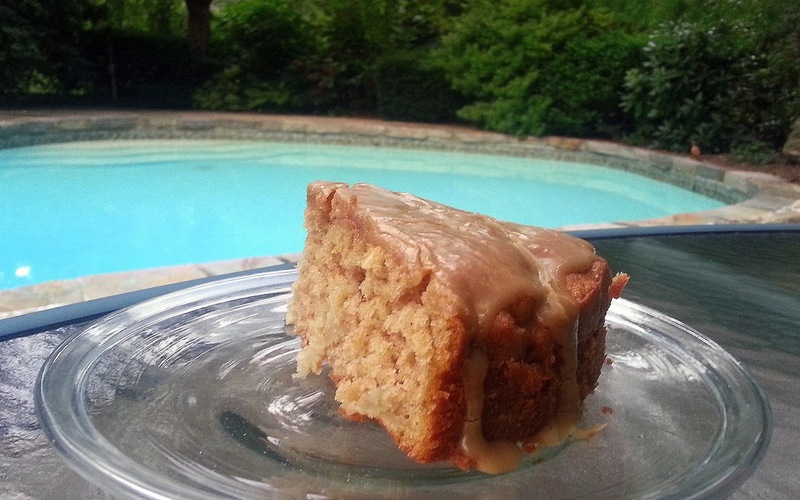 The recipe called for a 10 x 10 square pan but (not having that size), I used a 9-inch cake pan. 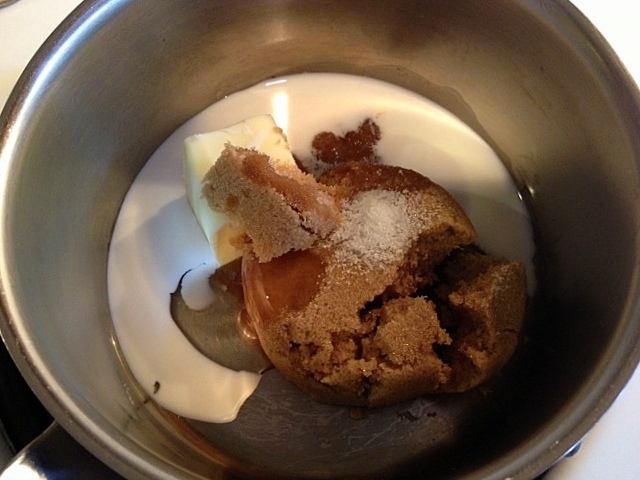 After baking, let the cake cool somewhat and turn out. 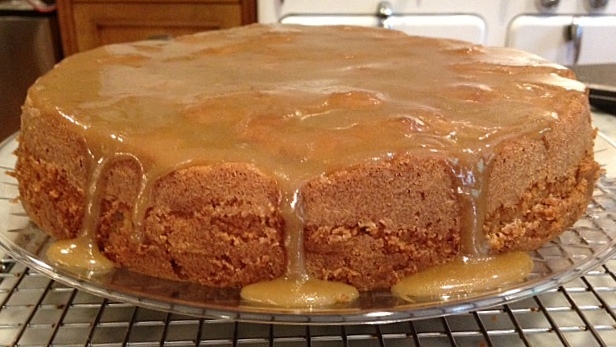 The only "trick" to this recipe is that you must make the caramel glaze while the cake is baking because it needs to cool and then be poured on the warm cake. Below is the start of the glaze. 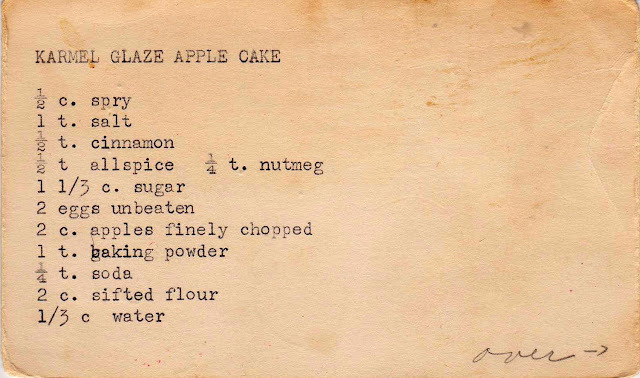 The recipe calls for one teaspoon of corn syrup to enhance the texture of the glaze. Do not skip this ingredient: the Karo Syrup sold in supermarkets and used in recipes like this is not the devil high-fructose corn syrup. I followed the recipe exactly, using butter in place of the Spry. (Is Spry even made anymore?) And I only sifted the flour once, not three times. 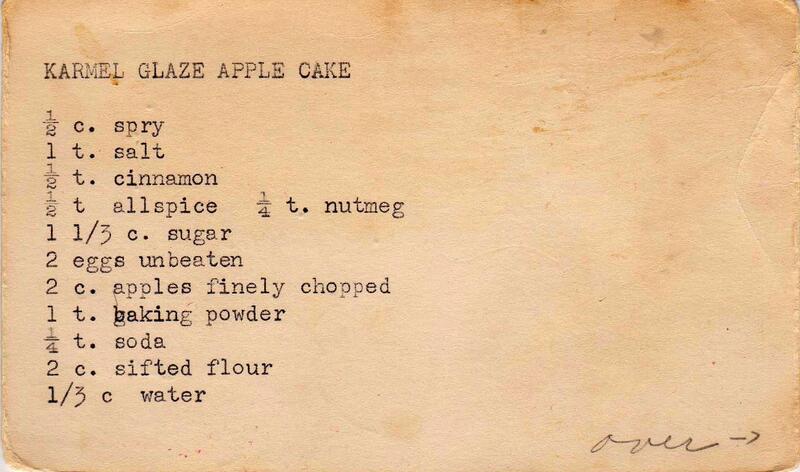 One of my favorite things about fall is baking with apples! I want to try this one. Well, a couple of things killed Spry. Lever Brothers stopped making Spry in January 1981. Originally they claimed they were still going to make it in California and were only discontinuing production at their original, 1930s-era Hammond, Indiana complex, which also produced Mrs. Butterworths, Imperial margarine, Swan dish soap, Dove soap, Life Buoy soap, and a handful of other consumer products, including Lucky Whip, which was like Cool Whip in a Reddi-Whip can. About 350 employees got laid off in anticipation of shutting down the Spry and Imperial lines. Lever said they'd just calculated that the cost of producing and shipping these products from Indiana was greater than just subcontracting out the production. 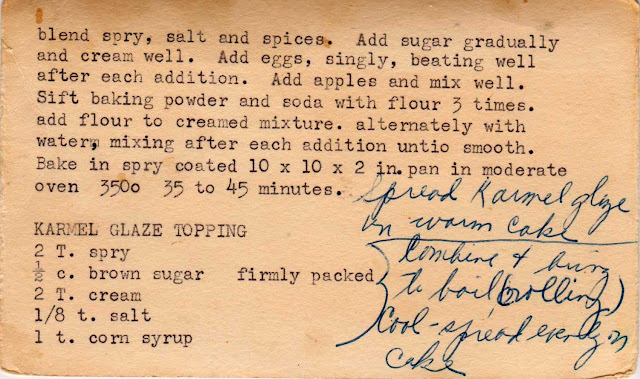 That was no problem for Imperial--lots of places made margarine. But Spry was a little bit more complicated. Third parties made and sold it until 1986. The last newspaper ads including Spry appeared around June of '86, when the price was 79 cents for a 3-pound can. Basically, the third party contractors ran into the same problem of high shipping costs; at the time, both Crisco and Spray came in metal cans. And consumers loved the metal cans for lots of reasons, primarily that you could heat them up to get the last bits of shortening out, or pour hot shortening used for frying right back into the can. The month after Spry sales stopped, Crisco (owned by P&G) switched to what they called a "fibre-foil" can, which was a very fancy way to say "a large toilet paper roll with aluminum thinner than a Jiffy Pop's dome." When consumers complained that this new can wouldn't let them do the things the old can did, P&G's helpful suggestion was to transfer the shortening into a Folger's can--a coffee brand owned by P&G. As a side note, it's no coincidence that P&G and Lever were both soap companies that got into the shortening business. In the early late 19th and early 20th century, not having to deal with the slaughterhouse cartels to get animal fat for soap was a huge advantage. But then, having generated a vegetable-based fat for soap, companies wanted to use it for anything they could. For what it's worth, the FDA was under the Department of Agriculture at the time and probably couldn't object unless the guy who invented the method happened to own a diary farm or plant sourgum. I got a bag of red pears in my produce subscription bin on Thursday, but I had this recipe in my head after seeing it here Tuesday. 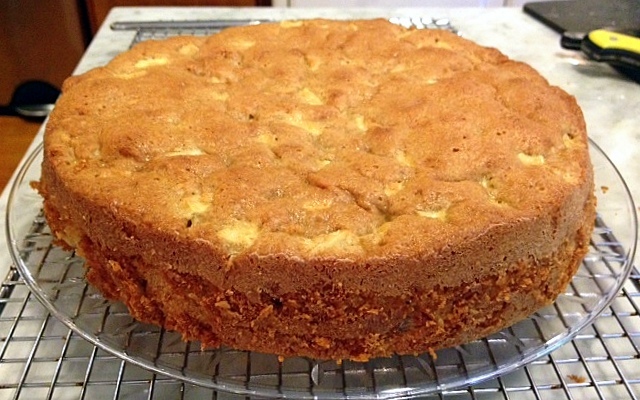 So, I baked it with pears instead. It turned out delicious and was a hit with my boys as a special after-school snack. I used a dark non-stick round cake pan and it took the full 45 minutes to bake. I think the only thing I would do differently next time is up the fruit to 2.5 cups (or more?). I enjoyed the other commenter's history lesson on Spry as I've lived in Indiana for the past 10 years. I had never heard of Spry before.